I'm sure you've been advised at some point in your life, to just "roll with the flow." 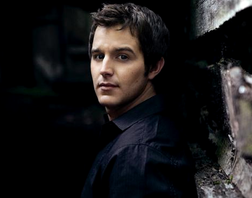 Well, it appears newcomer, Easton Corbin, has heeded that advice and his ability to "Roll With It" has taken him straight to the top of the country music charts and given him two consecutive number one singles off of his debut album. As he rolls with the flow, he has also learned how to raise the roof and I can vouch for that. I witnessed it first hand, this past week, when he played to a standing room only crowd at Cotton Eye Joe. As a youngster, Corbin won his fair share of FFA Awards which was most likely what encouraged him to earn a business degree through the College of Agriculture at the University of Florida. Although he was a devoted farmer, his true passion was always music, so it is only fitting that the awards he is compiling these days are all from the country music industry. Corbin has been nominated in seven categories by the American Country Association, the only totally fan voted country music awards. He has also been nominated for three awards by the Country Music Association. Corbin says, "Even though I didn't write, 'A Little More Country Than That,' this song identifies who I am." Appropriately enough, this song was his first number one hit. In his bio he says, "Like his heroes Strait and Whitley, [he] is unapologetically country. His songs, while rooted in the present, call to mind simpler times when the back porch was where folks gathered to network. Steel guitars and fiddles are as much a part of his sound as his baritone drawl." Corbin was surprised when Bruce Shindler, Vice President of National Promotion For Mercury Nashville, stepped onstage with Mike Hammond of WIVK Knoxville and Jed Bakri, owner of Cotton Eyed Joes, to present him with a plaque in celebration of his seven ACA nominations, and newest single, "Roll With It," hitting number one on the charts. This gives Corbin back to back number one singles. The plaque was autographed and will be archived at the venue. No matter how you "Roll With It," whether by bus, train, plane or your souped up, high speed, 4 wheel driv'in truck, when you pass a venue without a roof, you will know one thing for certain, Easton Corbin performed there the night before.